Completely accurate and reliable UI test automation of web and desktop applications regardless of the technologies in use. 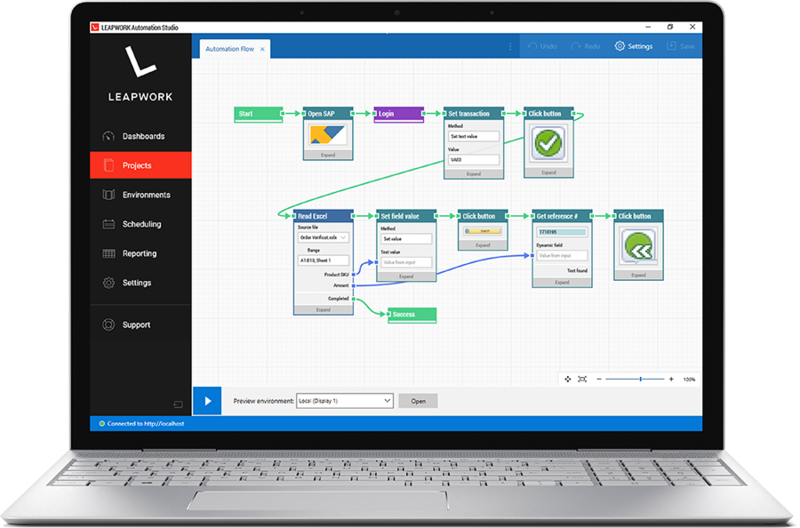 The LEAPWORK Automation Platform lets both technical and non-technical specialists design test automation flows, without ever typing or reading a single line of code – and then execute cases with the click of a button. 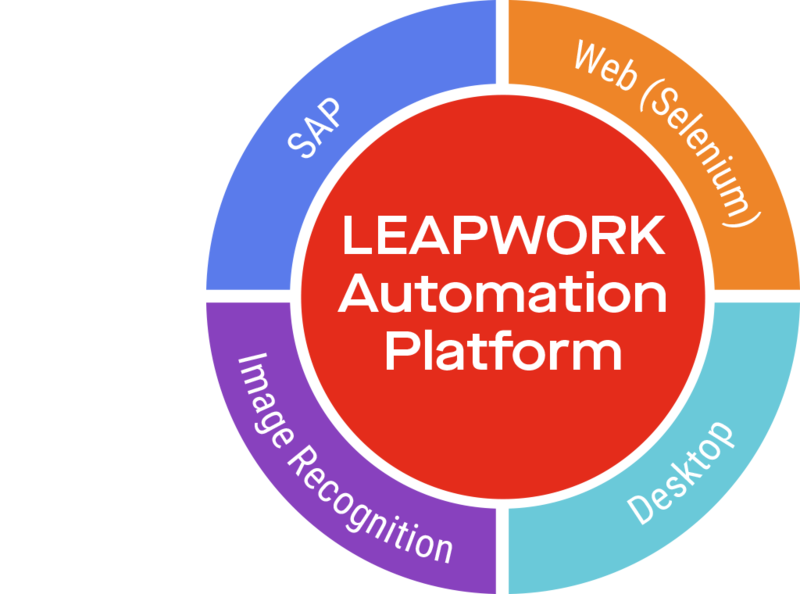 The LEAPWORK Automation Platform is a fully featured automated test tool. Users can build and execute test automation cases from day one with the flowchart-based designer. The LEAPWORK Automation Platform is both powerful and accessible as an automated test tool – even for complex testing requirements. At its core, the LEAPWORK Automation Platform relies on four major automation technologies, each solving specific types of test automation challenges. The capabilities can be used both separately and combined as needed. As an automated test tool, the LEAPWORK Automation Platform make it possible to automate any kind of application; from SAP, Citrix, and desktop applications, both in-house and cloud based, to web applications in desktop browsers and on mobile devices. With an automated test tool, you can design, execute, schedule, and monitor testing in one place. Work on test cases in teams, share project assets, and set up feedback loops across departments. The LEAPWORK Automation Platform is an automated test tool for specialists, generalists, and management alike. Run test automation cases on any device. Do it on premises, in closed networks, or in the cloud. A centralized Controller component takes care of scheduling and monitoring. Any parts of test automation flows can be re-used between cases, shared across teams, and be parameterized as needed. Never build the same sequence more than once. Run test cases with automated data input from spreadsheets, databases, PowerShell scripts more. Call external sources through APIs and HTTP requests and use the results live in cases. Improve the reliability of test cases by setting up fail-safe methods for how LEAPWORK interacts with application elements. By using the Strategy Editor, you can define an approach for retrieving any element specified in test automation cases. Scheduling of test automation cases is completely customizable in terms of frequency, time of day, and more. Test cases can be executed on an ad hoc basis or be scheduled to run as often as needed around the clock. When executed, every single step and activity in a test case are documented in three ways: A video recording, a debugging view, and a text log with timestamps. This makes it very easy to go through test automation cases step by step for troubleshooting and identifying where cases fail. Make the right decisions with powerful live dashboards and reports. Reports are exportable and fully customizable by using filtering and grouping options. Visualize test case performance data using dashboards of charts and widgets.